This review first appeared in the June, 1986 issue of Loud and Clear magazine. C'mon, Eddie, doesn't David Lee get on your nerves once in a while? Within a month, Eddie Van Halen had asked David Lee Roth to leave the most popular American band of the last decade. Whatever one might say about Roth, he had a style that would be hard, if not impossible, to replace. No raw rookie could hope to step in and answer the critics and fans. The new vocalist for the legendary Southern California band would have to be experienced, respected and well-known. Certainly, the selection of Sammy Hagar was inspired. No other American hard-rock singer comes to mind who has Hagar's proven track record, following or charisma. Van Halen's history is well-documented, but Hagar's bears a closer look. He first broke in as a vocalist for Ronnie Montrose in the early '70s, with anthemic rock songs like "Rock the Nation" and "Space Age Sacrifice." After the second album with Montrose, Hagar left to establish a solo career. He scored early with "Red," and again with "Plain Jane," "Heavy Metal," "I Can't Drive 55" and "I'll Fall in Love Again." In other words, in Hagar the band as acquired someone who had done something Roth has not yet proven he can do: establish a successful solo career with a chain of hits. Still, even with Hagar's impressive resume, adjustments have had to be made. The first album by the new lineup, "5150" (the police code for a lunatic needing to be picked up), shows some rough edges where the band and new singer have yet to mesh styles. Still, the overall effort is most impressive. For the most part, the album cranks with the energy and rhythm that made the L.A. band the immensely popular rockers they are. 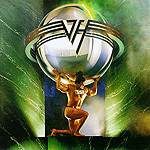 "Good Enough," "Best of Both Worlds" and "Love Walks In" are all patented Van Halen tunes, with Alex Van Halen's and Michael Anthony's heavy rhythms layered over Sammy's vocals. Standing out from it all, of course, is Eddie's guitar. On the album "1984," Eddie proved he was the new standard by which rock guitarists are to be measured, and he strengthens that argument on "5150." Admittedly, it takes a couple of listens to get used to Sammy Hagar singing with Van Halen, but if you give it a chance, "5150" will not only please you, but will impress even the most loyal Roth fans.